Monogrammed Gates Welcome You To The Club The Club House Overlooks The Courts The Comfortable Club House Lounge Basford tennis club is hidden away at the head of a secluded cul-de-sac near to the Polite Vicar public house and the New Vic Theatre, a few minutes' drive from Newcastle-under-Lyme and Stoke-on-Trent. 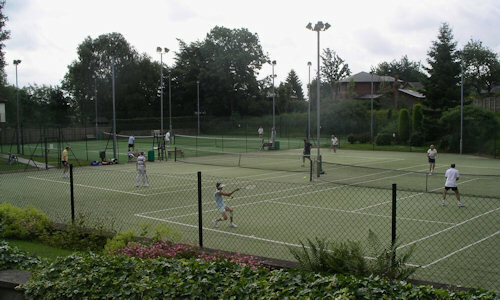 With four floodlit artificial grass tennis courts that are available until 11 p.m. (courts 3 and 4 only until 10:30 p.m.) every day of the week, there are plenty of opportunities for play. 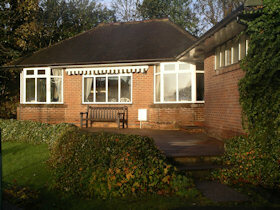 The club house contains a pleasant lounge with piano and very reasonably priced bar, a kitchen and changing rooms with showers. 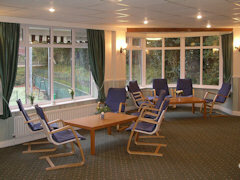 Outside, amongst the landscaping, there is plenty of seating for those wishing to take a break from the rigours of running round the courts, or for those simply wanting to soak up the sunshine whilst watching others at play. Although it is not a big club, Basford has several youngsters who are nationally ranked (i.e. inside the top 100 in their age group) with one reaching the top 10 in his age group, one reaching the finals of the Road To Wimbledon tournament in both 2007 and 2008, and several more players bubbling just outside the top 100. There is a good mix of competitive players who are keen to progress and social players who want to enjoy a good game in a pleasant environment with a friendly group of players. The club is lucky to have an excellent LTA licensed resident coach, Mike Armstrong, who provides group coaching for juniors, adults and the teams, as well as offering individual coaching at economical rates. Players of all ages and standards, both members and non-members, are welcome to take advantage of Mike's coaching skills. As well as traditional coaching, he can offer the use of a ball machine and video analysis to assist in the development of technique. Fred Perry Playing 'Bunny' Austin At Basford In 1936 Founded in 1883, the club was originally sited behind the Queen's Hotel and moved to the present location in 1926. 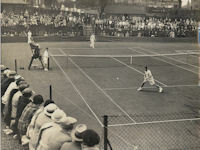 The club has hosted matches with well-known players such as the pictured exhibition match between Fred Perry and 'Bunny' Austin on May 11th, 1936, shortly before Fred won the gentlemen's singles at Wimbledon for the third consecutive time. You may like to read the Sentinel report about the match or some of the other newspaper articles about the club or read a potted history of the club.